In the days following Stalin’s collapse, his core team of ministers tussle for control; some want positive change in the Soviet Union, others have more sinister motives. Their one common trait? They’re all desperately trying to remain alive. 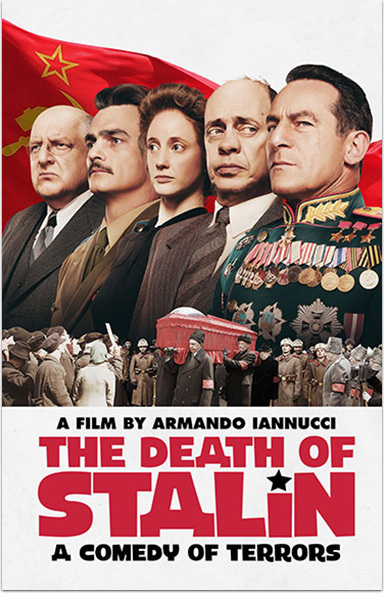 The internal political landscape of 1950’s Soviet Russia takes on darkly comic form in a new film courtesy of Emmy® award winning and Oscar® nominated writer/director Armando Iannucci. 3. Scroll to select "The Movie ChannelTM"
Oscar is a registered trademark and service mark of the Academy of Motion Picture Arts and Sciences. Emmy is a registered trademark of the Academy of Television Arts and Sciences. THE MOVIE CHANNEL and related marks are trademarks of Showtime Networks Inc., a CBS Company. You must be a subscriber of THE MOVIE CHANNEL to get THE MOVIE CHANNEL ON DEMAND.